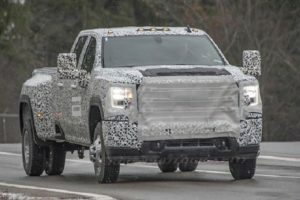 A range-topping GMC Canyon mid-size pickup has been rumored for two years, but now it seems that the carmaker finally works on it. 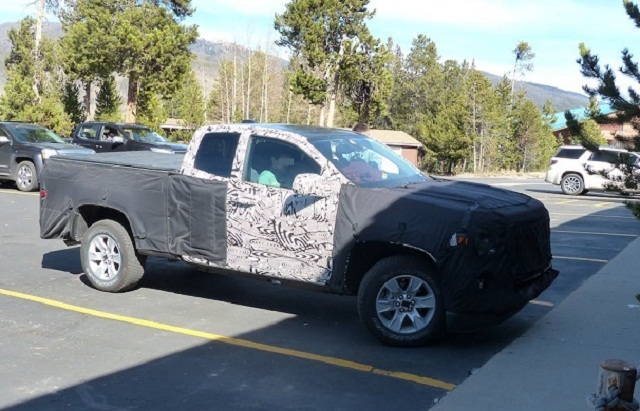 Actually, the prototype is already spotted, but since we saw a completely camouflaged testing mule, we don’t have the specific details yet. 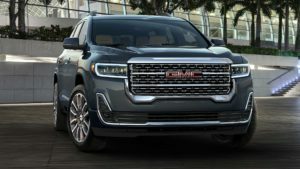 However, the 2017 GMC Canyon Denali will probably receive the typical top-trim stuff, starting from chrome-stylized exterior and luxurious and expensive interior treatment. Like we said, the wrapped pickup truck doesn’t show the details, but we managed to found out what will be the biggest changes. Unlike the regular model, the 2017 GMC Canyon Denali will feature a bright, chrome-heavy mesh grille, which will make an all new face of the pickup. In addition, there will be C-shaped LED headlights and taillights, as well as LED halogen fog lights. The truck will get HD headlights daytime running lights, while it is expected ride on 20-inch wheels. The upscale exterior appearance won’t come without suitable interior. Inside, the 2017 Canyon Denali will receive leather door panels, leather seats with French stitching, as well as real wood and aluminum accents. The premium pickup truck will upgrade it infotainment and entertainment, starting from eight-inch touchscreen, through a standard IntelliLink software, and Apple CarPlay, Android Auto, and 4G LTE Wi-Fi system, while there should be also an automatic climate control, premium audio and navigation, and full-power seating. The 2017 GMC Canyon Denali will likely get two engine options, but without Canyon’s base 2.5-liter four-cylinder mill. The pickup could offer a 2.8-liter Duramax turbodiesel, which will make 181 horsepower and 369 lb-ft of twist. The Denali fitted mid-size truck will also get a 3.6-liter V-6 with 305 horsepower. In addition to these two engines, the Canyon Denali is rumored to have an outstanding 5.3-liter EcoTec3 V-8 mill with 355 HP. The carmaker plans to introduce the 2017 GMC Canyon Denali next summer, and the estimated price start at about $42,000.